The space family Robinson is sent on a five-year mission to find a new planet to colonize, but the voyage is sabotaged time and again by an inept stowaway, Dr. Zachary Smith. The family's spaceship, Jupiter II, also carries a friendly robot who endures an endless stream of abuse from Dr. Smith, but is a trusted companion of young Will Robinson (`Danger, Will Robinson' became the show's catchphrase). 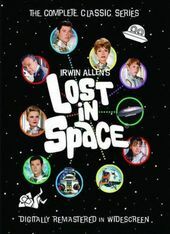 The sci-fi cult favorite was created by Irwin Allen, and inspired an uninspired 1998 movie.